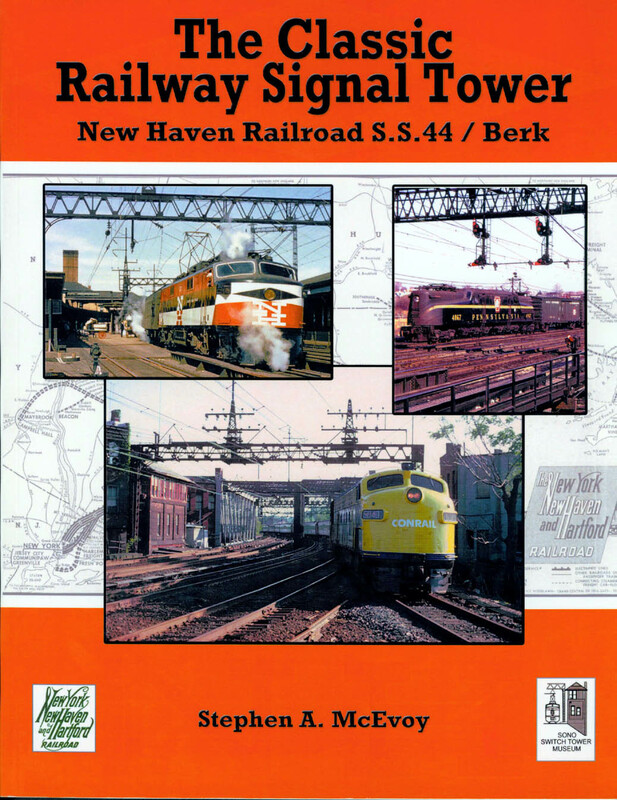 This book is dedicated to the many responsible men and women who have worked over the years in tower service on the New Haven, Penn Central and the many other American railroads. Elmer S. Meyerhoff was one such Tower Operator, whose distinguished New Haven Railroad career spanned the 65 years from 1888 to 1953. Welcome to the best book, bar none, ever written about railroad signal towers and their skillful staffs. I offer that opinion with conviction – since I have spent half a century studying railway technology, in all its aspects, including the art and science of train dispatching, signaling, and signal towers. How do trains – and fast-running ones, with many trains an hour passing the same point on intersecting paths – move safely on their way? The “sentinel of the railroad,” the “speeding train’s watchman,” and the “railroader’s guardian angel when danger lurks” – the interlocking signal tower has been called all of those things, and with justification. Author McEvoy brings more than 41 years of direct railroad experience to this book (see Pages 163 and 164), and it shows. As important, McEvoy writes plainly and clearly – in fact, lucidly – with sufficient insight and just enough detail that the curious lay reader, as well as future generations of readers, can really appreciate the basic principles by which the signal tower and its personnel did their all-important work. That work was fundamental: guarding the safety of speeding trains on complex routings, where the danger of collisions was ever-present. “You have done more than any man living ... to save human life.” So said King Edward VII, when he was the Prince of Wales, to one of the key inventors in the story of the railway interlocking, John Saxby. It was no exaggeration. By the 1860s and 70s, trains were running both in the United Kingdom and in the U.S. on growing networks of track, with increasing numbers of rail junctions and crossings of one rail line by another. Accidents at such places were becoming alarmingly frequent. The secret to safety on high-speed railways was – and still is – the interlocking: a rail junction comprising several possible routes, crossings, or diversions, in which it is impossible to send a train on an incomplete or conflicting route through the junction. Impossible? Yes, because the interlocking is one of the first “logic circuits” ever invented in industry. Part of a given pathway can’t physically be set and signals given to show the way is clear unless a complete path is set. How this fail-safe arrangement works is brilliant in its conception. The interlocking is not only a landmark in the history of safe railroading, it is a landmark in the history of the computers that all of us now use everyday. This book is not just the history of one signal tower. It is a story, really, of all such towers and of how they came to be and how they worked. The author builds the story step-by-step, in careful stages, so the lay reader can easily follow. And there is high drama, as you will discover. Best of all for this reader, the author includes a long overdue tribute to some of the men and women – women were tower operators on quite a few railroads – whose personal vigilance, skills, and experience kept the trains moving while ensuring a safe trip for them all. Steve McEvoy has an important story here. As a former professional railroader myself, I deeply appreciate his major contribution, both to the history of railroading and to the appreciation of that history. Steve gives thanks, as well, to the many people and their years of effort to save S.S.44/Berk Tower as a living memorial and educational museum. Read on; you have a Clear Board. For info, please email giftshop@westctnrhs.org.